Five spots where you can watch them like a hawk! Bradbury Mountain has the only spring migrating hawk count in Maine – and one of the few in the nation. POWNAL — Zane Baker stood atop Bradbury Mountain on a day that, despite the sun, still showed signs of winter. The path to the summit looked more like an ice slide than a trail. In the woods, the snow was three feet deep. Baker was not deterred. As the Bradbury Mountain hawk counter, Baker spends six days a week from mid-March to mid-May scanning the sky. It is one of the roughly 200 hawk counts that take place across North America – and it’s one of the few that happen in the spring. On a very good day, as many as 800 raptors can be counted at Bradbury Mountain State Park. Despite the name, hawk-watch sites, and the “hawk counts” that take place at some, are areas perfect for viewing migrating raptors of all kinds, including other birds of prey like falcons and turkey vultures. The counts encompass all raptors. Hawk counts in North America are usually scheduled in the fall when flight patterns of birds are more reliable. The fall migration is bigger because it follows the breeding season. Since young raptors have a survival rate of just 20 percent or so that first winter, far fewer birds fly north in the spring, said Derek Lovitch, co-owner of Freeport Wild Bird Supply, which sponsors the count at Bradbury Mountain. As the birds migrate north, they are funneled by the foothills of the White Mountains toward the Maine coast and, subsequently, right over Bradbury Mountain, Baker explained. From Bradbury Mountain, the hawks either head inland to the western mountains, north to the river valleys, or Downeast, Lovitch said, so most sites further up Maine’s coast see fewer birds. A short hiking trail, about a third of a mile, leads to the top of the mountain, where a rocky outcrop offers a 180-degree view. But don’t bother in the fall. The view to the north is obscured by trees, so birds migrating south can’t be seen until the last minute. Several factors contribute to a good hawk-watching site. Typically, they are wide-open viewing spots – either along the coast, high on coastal mountains or sometimes at inland mountains, like the aptly named Hawk Mountain in Kempton, Pennsylvania. Some hawk-watching sites serve as data-collection locations for the nonprofit Hawk Migration Association of North America. Birding organizations and volunteers have counted migrating hawks at these spots since 1974. Julie Brown, the association’s coordinator of sites, said of the 11 sites listed for Maine, counts occur at just five. Two, in Harpswell and in Cooper in Washington County, are on private property. The remaining three are at Clarry Hill in Union, Cadillac Mountain in Acadia National Park, both described below, and Bradbury. Counts can help reveal population trends, such as the decline in American kestrels or the increase in bald eagles, ospreys and turkey vultures. None of the top 10 hawk-watching sites suggested by the National Audubon Society are in Maine. But on the right day, you still may see a lot of raptors. Here are details on other Maine sites that the experts also recommend. All but Bradbury Mountain are best for the fall migration. Ranger-led hawk watches began in 1994 on Acadia National Park’s 1,530-foot Cadillac Mountain, the highest point along the Eastern seaboard. The fall hawk count finds about 3,000 birds annually, with sharp-shinned hawks and American kestrels among the 11 species frequently seen. It draws up to 70 spectators on the best days, with the road to the summit allowing easy access. There is a drawback, though. 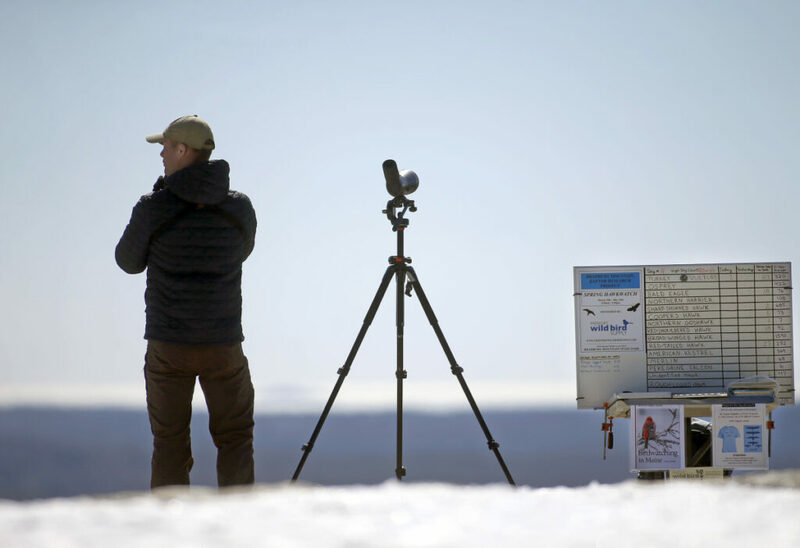 The best hawk-watching days on Cadillac typically have winds out of the north, west or northwest gusting 5 to 15 miles per hour, said Seth Benz, bird ecology program director at the Schoodic Institute, one of several groups that sponsor the park’s hawk watch. “These winds generally bring hawks closer to the mountain, to use the updraft off the ridge on which to gain lift in order to save energy as they migrate southward,” he said. Set on 700 conserved acres, Clarry Hill welcomes the public and offers far-reaching views. The 643-foot hill is the largest contiguous acreage (400 total) of blueberry land in the Midcoast. But the panoramic views of the Atlantic Ocean and western mountains are what draws birders. They come to see the migration of hawks, as well as some migrating songbirds and grassland birds, like the upland sandpiper. While not always predictable, it remains one of the best spots in Maine to get a good look at passing raptors. Joan Ray with the Midcoast Conservancy, which owns the preserve, said the view from the half-mile trail at the top is a unique vantage point in the Midcoast because it looks west toward Mt. Washington, which can be seen on a clear day. “None of the other hills are open the way Clarry Hill is. It’s a different kind of view. From the top of the preserve, you can see 270 degrees,” said Ray, the Conservancy’s land manager. Many raptors follow the coastline and hesitate to fly offshore. But not some falcons, such as peregrines, merlins and American kestrels. That makes Maine’s islands – especially Monhegan – wonderful hawk-watching sites. “They (falcons) are more power flyers,” said Steve Kress, the director of the National Audubon Society’s Seabird Restoration Program and a professor of ornithology at Cornell University. Lovitch said Monhegan is one of his favorite places to hawk watch since he’s a fan of the peregrine falcon. The York mountain can be a hit-or-miss hawk watch site because it sits toward the center of the southern coastal plain, so the raptors are more spread out. On the plus side, you can drive to the top of it. “Mt. A” not only has a remarkable 360-degree view that takes in Mt. Washington and the Atlantic Ocean, it has a mile of handicapped-accessible trails on the summit and two viewing platforms. If the hawks are passing above, then birders of all ages and capabilities can enjoy the sight.